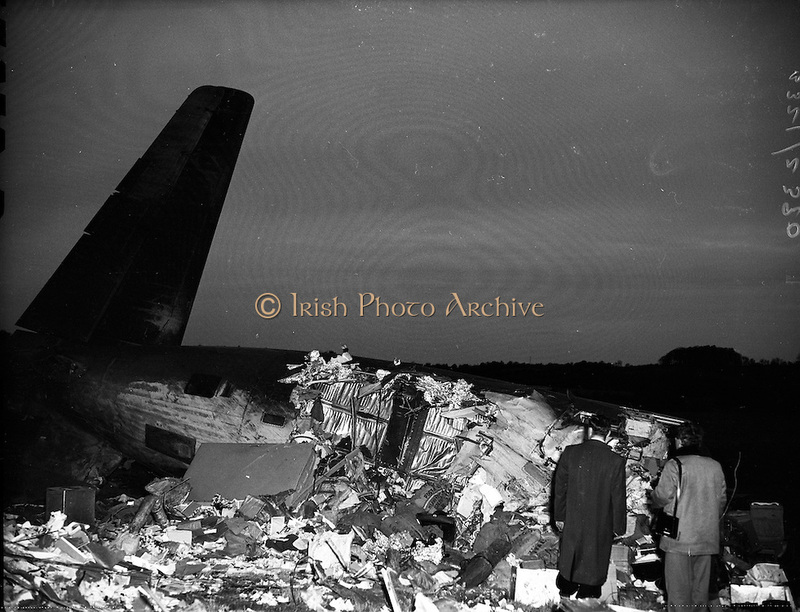 Air Italia Crash at Shannon Airport.26/02/1960..An Alitalia Douglas DC-7C crashed after taking off from the airport, killing 34 people out of 52 passengers and crew on board...The Alitalia flight, on the Roma-Shannon-New York route, was being flown under the supervision of a check pilot. The aircraft took off from runway 05 and a left turn was initiated at 165 feet height. Height was lost during the turn, and the left wing tip contacted the ground. The left wing and no. 1 and 2 propellers then struck the stone wall and grave stones of the Clonloghan Church. The DC-7 then impacted the ground at a 170-180 knots airspeed...An official investigation following the crash concluded: "No definite evidence leading to a particular reason for this accident was revealed by the investigation. It can only be concluded that the aeroplane lost height in a turn shortly after takeoff and struck the ground."